After World War I, architects around the world aspired to transcend national boundaries that had been devastated by conflicts. The result was a flurry of artistic creativity. In Japan, young architects strove to create an “international architecture,” or kokusai kenchiku, an expression of increasing international travel and communication, growth of the mass media, and technological innovation. 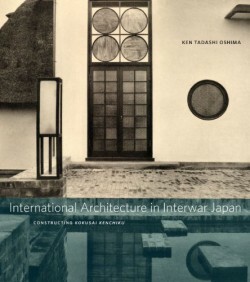 Ken Tadashi Oshima traces the many interconnections among Japanese, European, and American architects and their work during the interwar years by examining the careers and designs of three leading modernists in Japan: Yamada Mamoru (1894-1966), Horiguchi Sutemi (1895-1984), and Antonin Raymond (1888-1976). Each espoused a new architecture that encompassed modern forms and new materials, and all attempted to synthesize the novel with the old in distinctive ways. Combining wood and concrete, paper screens and sliding/swinging glass doors, tatami rooms and Western-style chairs, they achieved an innovative merging of international modernism and traditional Japanese practices. Their buildings accommodated the demands of modern living while remaining appropriate to Japan’s climate, culture, and economy. Until now, scholars have tended to isolate the work of Japanese architects from the European-American sphere of influence. Oshima reverses this trend, exploring the influences that flowed in multiple directions among architects in Japan and their counterparts in Germany, Austria, the Netherlands, and elsewhere. Sadly, few of the buildings of Japan’s interwar period withstood the destruction of World War II and the wrecking balls of subsequent decades of development. Oshima uses a wealth of photographs to vividly capture the character of the burgeoning architectural media of those years and to generously illustrate the works and visions of these pioneering modernists.